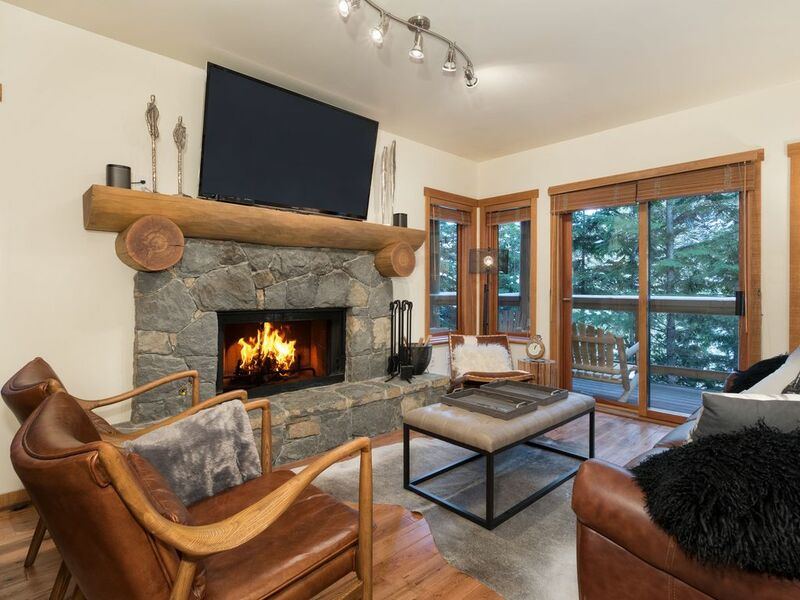 Taluswood Seven is a 2 bedroom, 2 bathroom, ski-in and ski-out luxury townhouse located in the upper Nordic area of Creekside. This is a quiet complex away from the crowds, situated close to Lower Dave Murray ski run and the Creekside Gondola. The unit was updated in 2018 to reflect a Rustic Contemporary design. A secure, heated garage to store your skis and boards in. The full kitchen has all new appliances. Nespresso and Keurig coffee makers. Queen bed in the master, with en-suite and a jetted tub. 2nd bedroom has two twin beds and separate bathroom with shower. Relax in front of the wood-burning fireplace. Firewood is included (as supply lasts). Watch your favourite sports or a movie on the 60" flat screen TV. Each bedroom also has HDTV. Ensuite washer and dryer. Natural gas Weber BBQ on large, private balcony. A communal hot tub in the complex is approximately a 5 minute walk from the unit. In the summer months only, there is also a pool open for guests. 24/7 guest services through our top-notch property management Mountain Hideaways. Stays of a week or longer include a mid-week service and linen change. Creekside is known for its laid back vibe, where many locals and discerning visitors come to escape the crowds. It doesn't lack in awesome Apres spots. Dusty's Bar & BBQ is located next to the Creekside Gondola. Aura restaurant and Cure lounge at Nita Lake Lodge, The Red Door Bistro, and the Rimrock Cafe all offer incredible dining experiences. Great pizza at Creekbread. Roland's sports bar is a funky spot to watch NHL and NFL. These are all within a 5 minute drive. PLEASE NOTE: This unit is not on a bus route. It is highly recommended that guests arrive with a vehicle as it is challenging to walk to the Creekside village from our place or get to the Whistler village area. Taxi service is available. Also note, the ski-in and ski-out trails are best suited for advanced skiers/riders, and not recommended for beginner/novice level. No smoking permitted in the unit. As per strata by-laws, there is no smoking permitted on balconies. Smoking at this property is only permitted outside on the driveway. Please dispose appropriately and safely of butts if you must smoke. I collect 16% in Federal, Provincial, and Municipal taxes on rentals. Larry and Sherri live in Vancouver and have been coming to Whistler since the 1980s. Creekside has a much more laid back vibe than the main village, and is less crowded during peak times. The Taluswood complex was built with quality in mind, and with unique touches that give it the "Whistler feel" of a mountain getaway. Ski-in trail accessed just above the Olympic Rings on Lower Dave Murray, and ends at Taluswood with a 2 minute walk back to the unit. Ski-out trail located across Nordic Drive and up 100 meters from entrance of Taluswood complex, approximately a 4 minute walk from the unit. gas assisted wood burning fireplace. single vehicle private, secure garage as well as guest parking available. leather sofa and comfy chairs to easily accommodate 4. Keurig single cup coffee maker, and Nespresso coffee maker. Full kitchen with induction range. 3 flat screen TVs: one in each bedroom, and a 60 inch TV in Living room. Digital box for each TV. Sonos wireless stereo, play your music from your mobile device, tablet, or laptop. Large private balcony with forest view and plenty of seating. ski-in/ski-out trails best suited for experienced skiers/riders. Communal pool available during summer months only. Our family of four (parents and two teens) had a great stay at Larry and Sheri's beautiful condo. Thanks to Larry's assistance, we were able to coordinate a grocery delivery/shopping in advance of our late night arrival, so we were all set with breakfast things for our first day of skiing. The condo is lovely - weather was far too warm for us to enjoy the fireplace - but we also enjoyed sitting out on the deck looking out into the trees. Spring skiing conditions made the ski in ski out trail a bit icy, but very manageable for our family of intermediate and advanced skiers. And Black Tie Ski Rental was the best! Highly recommend them! Fantastic property minutes from Creekside! Great unit, very clean and well appointed. Larry and Sherri were extremely helpful both in advance of the trip and during our stay! Would absolutely stay here again. Happy to have been helpful. Glad you enjoyed your stay, and hopefully see you again in the future. Cheers. Wonderful, well appointed property in amazing, quiet location! My family thoroughly enjoyed our stay at Larry and Sherri's Whistler property. The unit was just as described and photographed. It was exceptionally clean and beautifully decorated with great amenities. We appreciated the welcome basket upon arrival! The location, close to Creekside Village, was perfect for my family. We were able to make the first gondola ride up each morning and enjoyed all the trails Whistler Blackcomb has to offer. It was a pleasure to arrive at the condo at the end of a fun and tiring day and relax in such a quiet setting. The ski in/ski out trail was a bit too advanced for my children but my husband used it daily for an early start and said it was great. We frequented Creekside Village more often than Whistler Village during our stay. It was much quieter and less crowded. There were great restaurants (Creekbread Pizza and Dusty's BBQ are a must!) for evenings out but also cooked a few in the well equipped kitchen. Creekside Market had everything we needed. I would recommend this property to anyone seeking a relaxing and quiet stay in Whistler. My family is already counting down the days until we return and would rebook Larry and Sherri's unit for our next stay. We always appreciate it when guests take the time to write such a great review of our property. Thank you. We would love to have you back one day! A beautifully appointed condo that fit our family of four perfectly while we skied every day and celebrated Christmas on the slopes. The ski in/out was very convenient. We cooked several meals and the kitchen had everything we needed plus the items we purchased. The very comfortable beds and heated floors were perfect and we couldn't complain with the fresh snow we received during our stay. A very cozy stay. We had a small issue getting into the community hot tub because the lock had frozen, but it was remedied during our stay. Wish the complex would heat the pool year round!! Sherri was a fine host checking in on us upon arrival and during our stay. Jason the condo manager was also easy to reach when we had the hot tub access issue. Thankful for the opportunity to stay and would stay again! Glad you enjoyed your stay and found that the unit met your needs. As always, thank you for taking the time to write a review. I will re-book here the next time we travel to Whistler. The condo is spotless with details everywhere that made our stay so enjoyable. It felt as if we were the first people to stay there. Everything was new/updated. We enjoyed the fireplace immensely. For convenience there was a neat stack of wood in the garage. The hosts had instruction binders for any question we may have had. The kitchen was well equipped with top notch cooking utensils. We enjoyed family game nights with all the board games in a cabinet. Owners are extremely friendly and responsive and the property management company was helpful as well. Lots of small details made this a home away from home! I'm glad you enjoyed your stay, and thank you for taking the time to post a review.